Over 22 million customers have enjoyed the haven of an Emirates Lounge since the airline opened its first international lounge outside of its Dubai hub, and demand is growing. 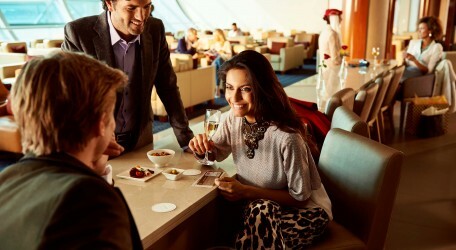 In the financial year ending March 2014, more than four million customers were served at the 36 Emirates Lounges around the world. These lounges are staffed by a 1,400-strong team who can interact with customers in over 25 languages. Emirates opened its first international lounge in Brisbane in 2004, offering the same high standard of service and quality of products that premium customers can expect on-board. The airline has since invested over US$320 million in its lounge network, to open new facilities and refurbish existing ones. Combined, Emirates Lounges span an area of 69,565 sq m, and can seat 11,526 customers at one time, reflecting the demand from customers in tandem with the airline’s growth. “We have made significant investments to develop our network of lounges over the last decade, and we will continue to invest in this product, because we see it as an integral part of the total value proposition for our premium customers,” said Mohammed H. Mattar, Divisional Senior Vice President, Emirates Airport Services. Emirates operates 36 dedicated lounges around its six-continent network including lounges in Auckland, Bangkok, Beijing, Birmingham, Brisbane, Colombo, Delhi, Dubai (x6) , Dusseldorf, Frankfurt, Glasgow, Hamburg, Hong Kong, Istanbul, Johannesburg, Kuala Lumpur, London Gatwick, London Heathrow, Manchester, Melbourne, Milan, Munich, New York – JFK, Paris – Charles de Gaulle, Perth, Rome, San Francisco, Shanghai, Singapore, Sydney and Zurich. Visit: http://www.emirates.com/ae/english/flying/lounges/lounges.aspx for more information on services and facilities offered in the Emirates Lounge. Emirates currently operates daily scheduled flights between Malta and Dubai via Larnaka, Cyprus.